Big boxing events don't come along very often, and ones which grab my interest come along even less often. In my youth most of them involved Mike Tyson. In more recent years they typically they involve Floyd Mayweather Jr., although there was a small period of time where I was a big enough fan of Manny Pacquiao that I actually called every sports bar in town trying to find one that would show his fight with Oscar De La Hoya. It turned out to watch it I'd actually have to drive across the river to a local casino that was showing the pay per view, no cover (I would have been willing to pay one), in what turned out to be a VERY crowded ballroom elbow to elbow with very passionate boxing fans. The food was pretty good and I would have gone back for the next Pacquiao fight, but they stopped showing boxing, and after that I just periodically checked out whatever Mayweather fights I could see a replay of. If they still showed boxing pay per views I might have gone back this weekend to see Canelo Alvarez vs. Julio Cesar Chavez Jr.. Both fighters had a pretty incredible record going in. Alvarez had 48 wins with only 1 loss and 1 draw, and that loss was to the aforementioned Mayweather. He had strung together six straight wins since that defeat culminating in his fight with Chavez on May 6th. Chavez was certainly not a slouch though with 50 wins on his record coming into the pay per view, one draw and only two losses. Both of those losses were costly for Chavez though - dropping the WBC middleweight title in 2012 to Sergio Martinez and failing to clam the vacant WBC international light heavyweight title against Andrzej Fonfara in 2015. The loss to Fonfara was notable for Chavez being dropped by a left hook in the 9th round, deciding not to come out for the 10th round, effectively giving his opponent the TKO win. All three judges had him behind in the fight before he quit. It may seem in hindsight like the outcome of the fight this weekend was inevitable. Even though at 31 Chavez should conceivably be hitting the prime of his career, we had already seen him be smoked by a man only 2 years his junior in Fonfara. 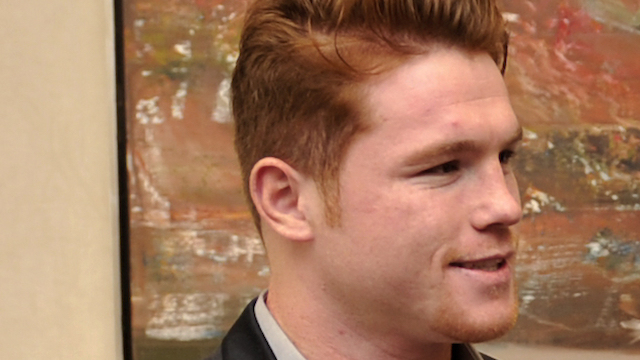 Meanwhile the 26 year old Santos Saul Alvarez Barragan ("Canelo" is actually his nickname - a reference to his fiery cinnamon red hair) is already considered by many to be one of the pound for pound best boxers in the world, with only the aforementioned Mayweather rivaling him - and considering Mayweather is undefeated to this day there's no shame in Alvarez' game for taking that L. Still Chavez had bounced back from the loss to Fonfara with two straight decision wins, and a third straight victory would have once again made Chavez a player in boxing. Considering he went undefeated for nearly a decade from 2003-2012 one could have argued that Chavez had been primed by his recent wins for a huge career comeback, and bouts between two fighters who have nearly 100 wins between them don't come along very often. Yes, this one was big, and by some estimates did at least 1 million buys on pay per view. If you're a Canelo Alvarez fan and you bought this show, odds are you feel like you got your money's worth. If you're a Chavez Jr. fan you're probably looking at the charge on your cable or satellite bill and going "WTF was I thinking?" Maybe you lucked out and found a bar showing the fight to go to, whereas all of them where I live now either show MMA or nothing at all. Had I gone to see it though in the words of Georges St-Pierre, I would not have been "impressed with the performance" of Chavez. He lost the fight by a unanimous decision of 120-108 on all three scorecards, was booed by the Las Vegas crowd for his inactivity in the later rounds, and Alvarez landed 228 shots compared to just 71 for Chavez. Actually I think even an Alvarez fan might have been bored with just how one-sided this fight turned out to be -- happy their man won but disappointed that his opponent was little more than a punching bag with legs. That's not likely to happen with Alvarez' next opponent though -- and the fight has already been made. It might be time for me to find another bar that shows boxing. Meantime for Chavez Jr. there are a lot more questions than answers with three significant losses in the last five years. He's far too young to contemplate retirement, but it might be time to completely rethink what team he trains with and what kind of cardio and conditioning he has for fights. The search for a new and improved Chavez Jr. begins now, while Alvarez keeps rolling right along to a mega fight with "Triple G" in September.